Beer is not only about the brew that lands on your table. The journey of beer starts long before malting, mashing and fermentation done in ideal conditions and compositions. It starts with the right equipment and its capability to consistently produce international quality of beer. At Hypro we understand this fundamental need of beer manufacturers to offer a pleasurable beverage to consumers. Recognizing the challenges faced by the industry and foreseeing a global need, we capitalized on the opportunity to display our domain capabilities. At Hypro we manufacture a wide range of brewery equipment’s including Pub Brewery Equipment, Beer Storage Tank, Brewery CIP, Brewery Plant, Brewing Vessel, CIP System Brewery and Recovery Plant that guarantee high efficiency and consistent quality of beer. Our infrastructure facilities and machinery is regarded as one of the most modern and quality conscious unit performing at par with international players. Systems are assembled, components are wired, tested and delivered ready for installation at far-stretching client sites. The Hypro self-reliant fabrication machinery includes a press shop, spinning equipment, rolling, cutting & welding, automatic surface preparation for tanks inside out. The blueprint of every innovative product and solutions is drawn keeping in mind the design aptitude, seamless process and systematic systems to achieve the desired results without hurdles hampering the final output. A synergized combination of our efforts has enabled us to earn the reputation of an ‘innovation creator’. Technology is at the forefront of all our endeavors. Regardless of the design and process, we stay ahead of the game by continuously innovating our products and services with the aid of technology trends. We aim to be the game changer for the industry, client business and the future of brewery products. To create the finest results requires more than industry experts specializing in designing and manufacturing state of the craft products. Hypro engineers are meticulously scrutinized on basis of their qualifications and out-of-tank thinking. Our team of engineers are constantly researching, innovating and conceptualizing future first products that serve the customized needs of the industry. At the cost of development, social responsibility is never compromised. 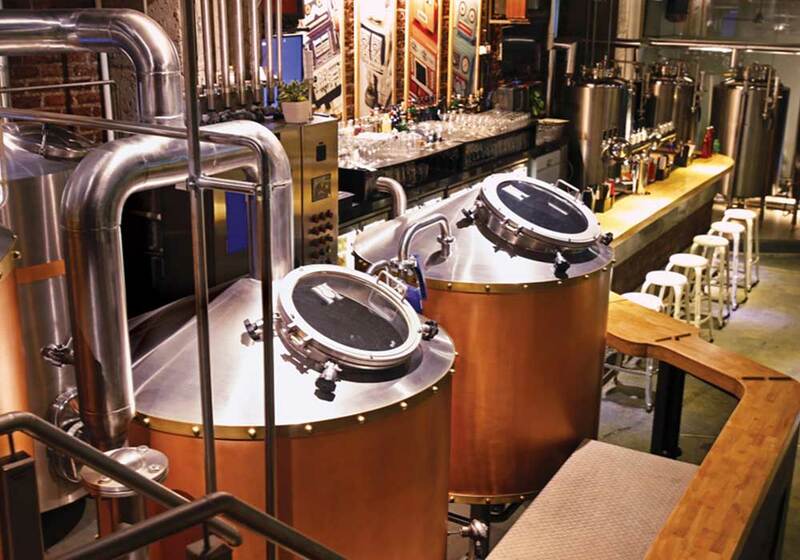 We offer turnkey projects to Brewery Plants by establishing the entire line of integration including Malt Reception, Brew House, complete Cellar Plant, Filter Plant, Bright Beer Tanks and CO2 Recovery Plants. With its Multi Evap Split Refrigeration system, we architect the brewery to conserve energy since inception. Hypro integrates Boiler, Water Treatment, Compressed Air, Effluent Treatment & Electricals with the Process Plant. Armed with rich experience of having worked with global beer brands, Hypro offers complete process and systems for International brewers. Innovative products like Smart Wort Cooling systems add value to Hypro plants and benefit the end customer to save power. There are multiple brewing process options demanding customized solutions to optimize costs and capacity. Our vessels fit the bill and brew to formulate the finest and superior quality beer. All our pressurized tanks and storage are coated with high-grade surface finishes and weld seams, backed by an efficient cooling concept giving space and time for the beer to brew with the required maturity. Hypro Beer Storage Tank and Hypro fermentation tanks provide exactly those assured conditions. They are tailored to cater to diverse styles and the specific system of fermentation parameter control operated by your brewery. Every product from Hyro is assured of 3 years manufacturer guarantee, quality assurance and commitment and after sales service. Our technology conceived Brew House product offers Semi Auto or Fully Automatic plant to help brewers view and control their Brewing Process & Operations. Hypro offers Brew Houses Mash kettle, Lauter tun, Wort Kettle with Internal OR external thermosyphon, Whirlpool, Wort Boiling with vapour energy recovery, Whirlpool with DMS stripping. We have recently conceptualized a solution for industrial brewery with Mash Filter along with the Brew House. We take pride in announcing our Greenfield brewery installation in Andhra Pradesh seamless solutions encompassing process + Utilities + Integration + complete Automation. This will be our first Greenfield industrial brewery project with 200,000 HLPA with an expansion capacity to 750,000 HLPA. Hypro complete Yeast Propagation, a Storage & Pitching system designed with hygienic aspects as a focus and offers the Brewer a plant and its ancillaries, that can effectively CIP and keep contaminations at bay. The Yeast storage systems are equipped with agitation at low speeds to avoid shear damage to the yeast cells. Gravimetric pitching is provided as a standard. Unitank cellar is offered by Hypro with rigid piping to complete the automation of the process. The Unitanks are designed and built at the Hypro factory to match international codes with a high quality internal surface finish. Our tank safety and cleaning devices are procured from the best suppliers in Europe. We offer factory-insulated tanks upto 3000 HL. In addition, we can also fabricate tanks of lower capacities if the site condition and client need arises. We are one of the very few with a unique capacity to build and install Unitanks upto the capacity of 5000 HL on site. Having built 150+ Unitanks since the last decade, we sign-off with reliability to the systems. Bright beer tanks are designed as a standard for pumped beer transfer. Especially for European manufacturers, we offer KG filter systems. The plant is integrated tanks along with beer carbonation systems. For HGB we offer a solution for De-Aerated Water production, blending and carbonation from our association. In India Hypro has already in process onfinstalling own designed DAW plants. Our CIP stations include Hot & Cold CIP loops that are designed and serve the process as per application need. Hot CIP Systems is offered for process equipment and piping handling Grains and separately for systems that do not handle grains. Similarly, in the Cold Cellar separate CIP is provided for equipment and systems with yeast and systems without Yeast. CIP stations are provided with an option of Automatic and semi-automatic plants which offer the operator” ease of operation” and stress-free functioning. Hypro is a lead supplier of CO2 recovery plants in India providing quality and energy conscious products to deliver safe and efficient CO2 recovery systems. Selling is not our ultimate goal, evaluating the system feasibility and backing it up with handholding after sales service is our criteria. The strength of our infrastructure, diverse industry experience has laid the foundation for attracting international clients. Complemented with evolving technological know-how, raising the bar standards, transparent business policies and ethics continues to help us maintain market credibility and respect. Our reliable and proven technology for CO2 recovery and purification results in an unbeaten MEE CO2 Recovery plant with assured output quality of CO2 99.998% v/v, with MEE standing for Most Energy Efficient CO2 Recovery plant. Gauging the ever changing Indian government policies and the demand for our products from international markets, we made a strategic decision to focus on global clients. Within 8 months of re-engineered business plans, we have dispatched CO2 recovery plant to Diageo in Africa, designed and manufactured to precision matching European standards with CE marking. In addition, we have proudly bagged 3 international projects from Switzerland, Washington and the Hawaii Island. When you partner with Hypro, you partner with extreme supremacy of design, process, innovation brewed by customized technology. Next time you guzzle beer on the table, think Hypro!